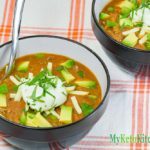 A mild dish with an intense flavor; that's how we describe our Low Carb Taco Soup. It's a perfect dish for a mid-week meal and very tasty! In a large saucepan place the butter, diced pepper and garlic and saute over medium heat for 3 minutes, until the butter is bubbling. Add the oregano, cumin and paprika and saute for a further 3 minutes, until fragrant. Add the tomato puree and chicken stock and bring to a simmer. Add the pork carnitas, salt and pepper. Allow to simmer for 2 minutes to ensure the pork is heated through. Ladle the soup between three bowls and garnish with the shredded cheddar, diced avocado, cilantro and sour cream.